Like the American Revolution that preceded it by 14 years, there was a long fuse leading to the powder keg of the French Revolution. Every historian will tell you that the French Revolution was the product of a number of factors: malnutrition and hunger from a series of bad harvests and the resulting spike in the price of bread, the country’s financial crisis arising from France’s loss in the Seven Years’ War and its foray into the American Revolution and, crucially, the unwillingness of France’s Ancien Régime to address these problems effectively. 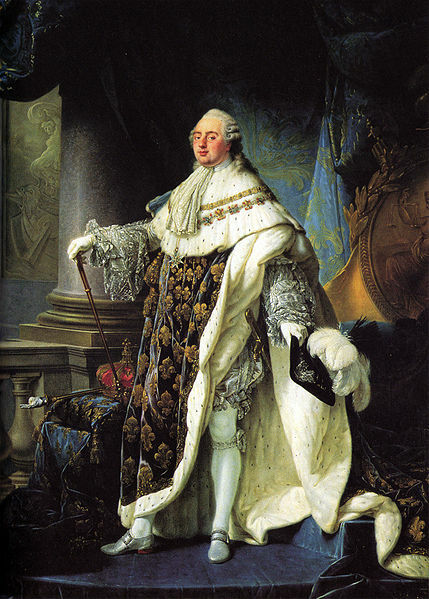 King Louis XVI’s series of finance ministers had repeatedly attempted to address the crisis by calling for reform of France’s regressive tax structure that placed an inordinate burden on the poor to the benefit of the aristocracy and clergy. Not surprisingly, this progressive idea was adamantly opposed by the country’s parlements (regional bodies representing the aristocracy that exercised limited veto power on such matters). Eventually, in 1787, the King called an Assembly of Notables (144 Princes of the Blood, archbishops, nobles, judges, and city leaders) in an attempt to gain enough support for tax reform. The Assembly had no real legislative power, but the King hoped to convince the Assembly to support reform and influence the parlements. The Assembly ended up acting in its own financial interests, however, and refused to lend support to the plan, advising instead that the King must call a meeting of the Estates-General. 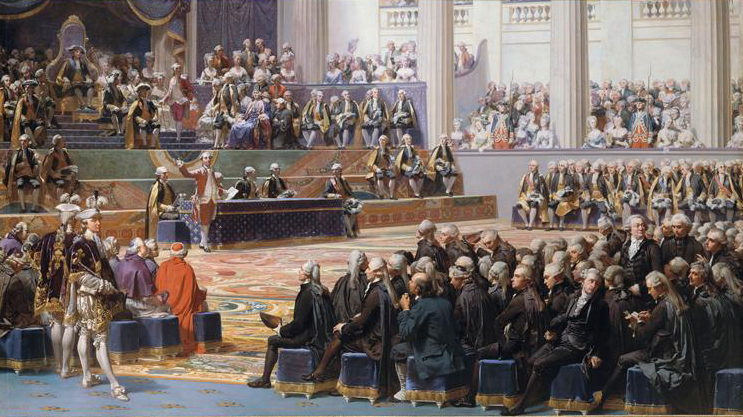 As a result of the impasse and under the influence of his Director General of Finance, Jacques Necker, the King finally called for such a meeting to be convened in 1789. It would be the first meeting since 1614 of the three Estates of the French realm: the clergy (the First Estate), the nobility (the Second Estate), and the common people (the Third Estate). 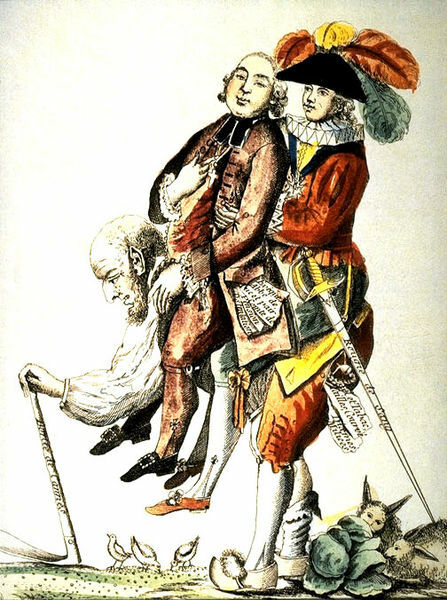 In prior convocations, the three Estates had been represented by an equal number of representatives, but changes in the political climate caused by the emergence of a more influential bourgeoisie prompted the King to double the representation of the Third Estate for the 1789 meeting. Elections for representatives of each Estate took place in January 1789, and the body convened on May 5, 1789 in the village of Versailles, just outside the King’s palace there. The King opened the Estates-General from his throne, flanked on his right by 291 representatives of the clergy, flanked on his left by 270 representatives of the nobility, and facing 578 representatives of the Third Estate at the far end of the chamber. It was at this ill-fated meeting that the French Revolution was about to be born. The intent of the King was that the Estates-General would move directly to consideration of taxes after “verifying” their own elections, but there remained an open question about how votes would be counted. Despite doubling the number of Third Estate representatives, the old system of voting (“vote by order”) was that each Estate voted separately within its own chamber and then cast a single vote representing its collective decision on the question at hand. This system insured that the clergy and nobility, with allied interests, could act with impunity against the will of the Third Estate, despite the fact that the Third Estate represented just over 50% of the Estates-General. (This is not even to mention the inequity that the Third Estate, in reality, represented some 95% of the King’s subjects.) The question of “vote by order” consumed the deliberations and, during the ensuing weeks, the meeting descended into stalemate as the Third Estate refused to verify its own elections until the question was settled. While the First and Second Estates met behind closed doors in their chambers, the Third Estate’s deliberations were open to the public, an act of transparency that would play well to public opinion as the crisis unfolded. On June 10, one of the Third Estate’s representatives, the Abbé Sieyès (a member of the clergy, but elected to represent the Third Estate) finally moved that they verify their election results and invite the other Estates to join them, with the warning that they were prepared to move ahead with state business with or without the others. Some representatives of the First and Second Estates, including 19 parish priests and certain liberal nobles like the Marquis de Lafayette joined the Third Estate, now calling themselves the Communes (the “Commons”). 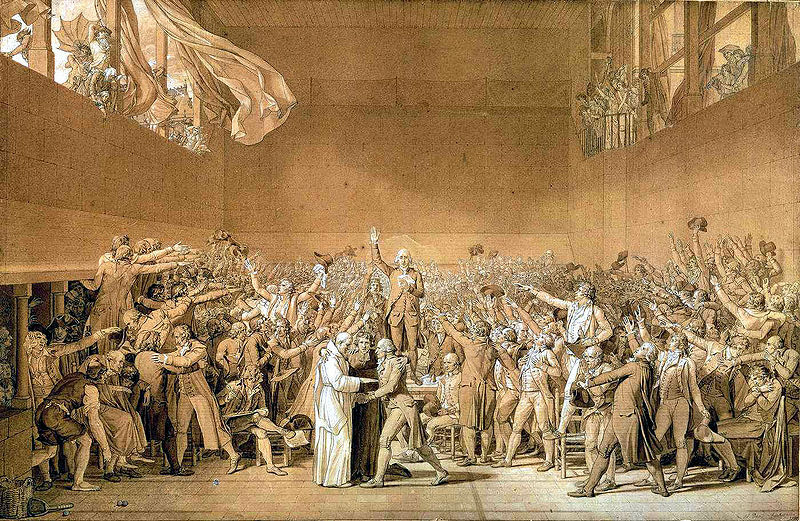 On June 17, the Communes took what can legitimately be called the first act of the French Revolution: the verification of their elections and the declaration of their assembly as the “National Assembly” — no longer representatives of separate Estates, but one body representing the entire French nation — with the intent to work with those who had not yet joined them, but with the power to conduct the nation’s affairs on their own. That day, in the heat of the revolutionary moment, the National Assembly also voted to outlaw all taxes until a new system could be created to replace them. Two days later, the entire First Estate (the clergy) voted to join the National Assembly. The King, of course, was none too pleased with all of this, and he moved to annul the National Assembly’s decrees and force a separation of the Estates. On June 20, he ordered closed the Salle des États, where the National Assembly had been meeting, and posted a notice of a Royal Session to be held on June 22. Finding themselves locked out of their meeting room and suspecting a dissolution of the Estates-General on June 22, the National Assembly simply reconvened in the King’s tennis court, the Jeu de Paume. It was there that they took the now famous Tennis Court Oath (Le Serment du Jeu de Paume) that they would not dissolve until they had created a new constitution for France. When the Royal Session was held on the 22nd, instead of dissolving the Estates-General, the King presented a number of reforms, but he continued to use veiled threats and to refer to the Assembly as three separate Estates that must obey him. The Assembly refused to leave the chamber unless at bayonet point, and then they retook the oath; the King finally relented and allowed them to remain in the room. Forty-seven more nobles subsequently joined the Assembly, and the King, seeing the situation spiral out of his control, officially ordered the First and Second Estates to join the Assembly. He continued to pressure them to submit to his demands, but it was too late. The Revolution had begun. Meanwhile, in Paris, word of the National Assembly’s actions had spread and revolutionary fervor gripped the city. The poor of Paris rioted over food shortages and soaring prices, and a mob of 4,000 liberated some mutinous soliders from a city prison. Back at Versailles, the King ordered the palace surrounded by additional troops and ordered reinforcements to the capital. He also made the mistake of dismissing Necker as Director General of Finance on July 11, blaming him for the failure of the Estates-General. Necker had become more and more popular among the common people as his popularity plummeted at Court, and his dismissal was viewed as a move against the National Assembly. The next day, incensed by Necker’s dismissal and by the arrival of foreign mercenaries in and around Paris, the people of Paris rioted again and were joined by members of the Gardes Françaises (one of the King’s personal infantry units). After a crowd in the Tuileries was attacked by a cavalry unit, the revolutionaries reacted by arming themselves. On July 13, revolutionaries raided the Hôtel de Ville (the city hall) searching for weapons, but found only a large stash of gunpowder. Remembering that the Bastille, an infamous fortress and political prison just to the east, contained a large armory, the revolutionaries marched on it the next morning. After several hours of combat, the commander of the fortress opened the gates to the mob to avoid a massacre of his garrison. The Bastille, once a symbol of the absolute power of the King, had become a symbol of the power of the people and their Revolution. 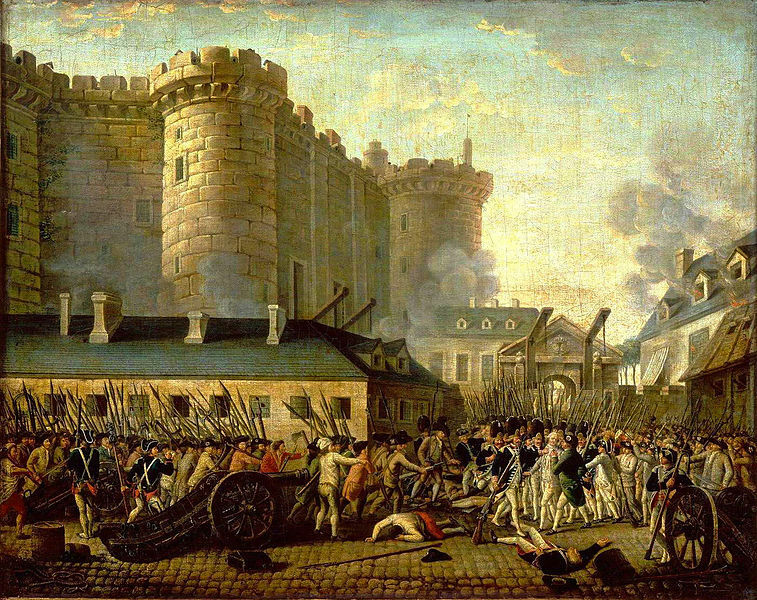 The history of the French Revolution after July 14, 1789 is long and complicated. We often gloss over the turbulent political maneuverings that marked that revolutionary decade. France did not become a republic right away. Within weeks of the storming of the Bastille, the National Assembly would abolish both the feudal privileges of the Second Estate and the tithes owed to the First Estate. It would publish the Declaration of the Rights of Man and of the Citizen, a remarkable statement of principles regarding the relationship of the state to its citizens, imbued with the Enlightenment doctrine of natural and universal rights. France’s constitutional documents would redefine the powers of the state and the church and their relationship to the people. But France would remain a monarchy for more than three more years. The first “Bastille Day” celebration on July 14, 1790 celebrated that very fact. 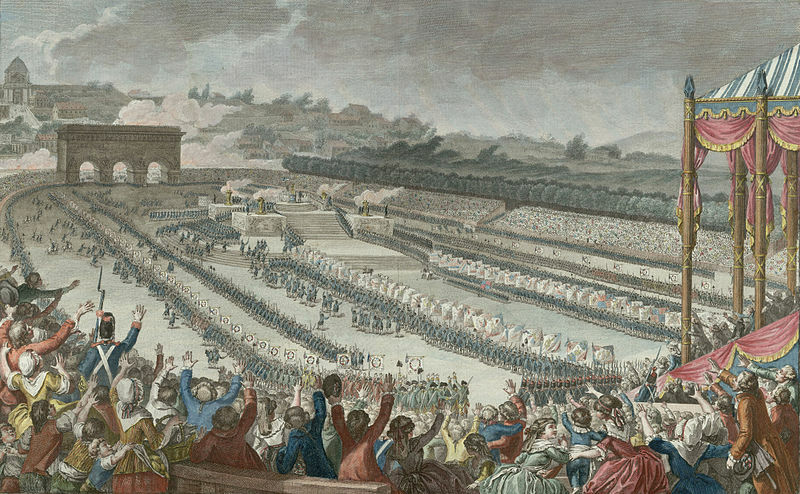 Held on the Champ de Mars (near the present site of the Eiffel Tower), the Fête de la Fédération commemorated the storming of the Bastille, the establishment of a constitutional monarchy, and the “end” of the French Revolution. Attended by the King and his family, it featured a Roman Catholic mass performed by Bishop Talleyrand as well as an oath of “fidelity to the nation, the law, and the king” sworn by all the participants. It would take many events over several years for the French monarchy to be abolished and for a French Republic to be installed, and the history of France afterwards would not cease to be a tumultuous one, with dictators, emperors, kings, and four more republics in between. The date and manner of celebrating it would change over time, but the storming of the Bastille on July 14 would eventually become a symbol of the struggle of the French people for their liberty and the unity of their nation, and that’s why … and what … we celebrate today. Both Michel and my best friend think I need to get a degree in French history from the Sorbonne. Hmmm.